AMPLIFIES SOUNDS FROM 60 FEET AWAY! Enhance your hearing with the turn of a dial. 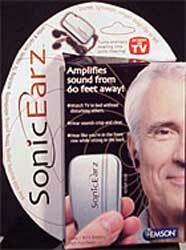 Whether your in a crowded room, watching sports, having fun outdoors, bicycling, jogging, or at the movies, SONIC EARZ, this small portable hearing aid device, can be used anytime, anywhere. No more missing out on anything! With the volume control switch, you can select the perfect level of amplification. Amplifies up to 50 decibels! Discreet and lightweight!